The EUR/USD currency pair keeps moving according to the Forex forecast. 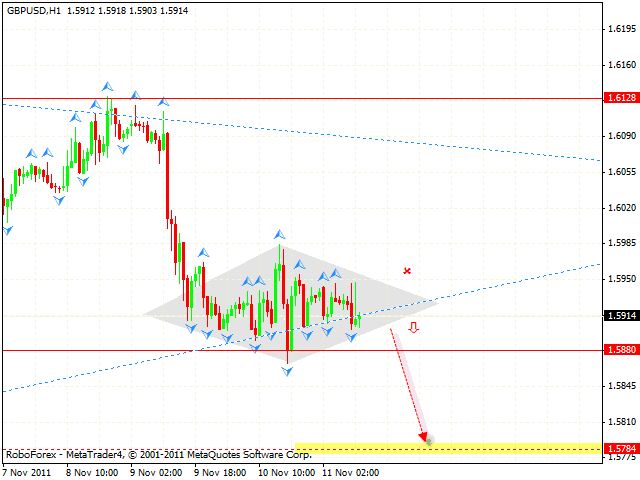 At the moment we can see the formation of the descending symmetrical pattern with the target in the area of 1.2850. We should expect the price to fall to the level of 1.3290, which may be a starting point of the correction to the channel’s upper border. One can consider selling the pair with the tight stop. If the price leaves the descending channel, this case scenario will be cancelled. Pound continues testing the support level in the area of 1.5880. Currently we have “diamond” pattern forming. After the price breaks the pattern’s lower border we can try to sell the GBP/USD currency pair with the stop above 1.5950. 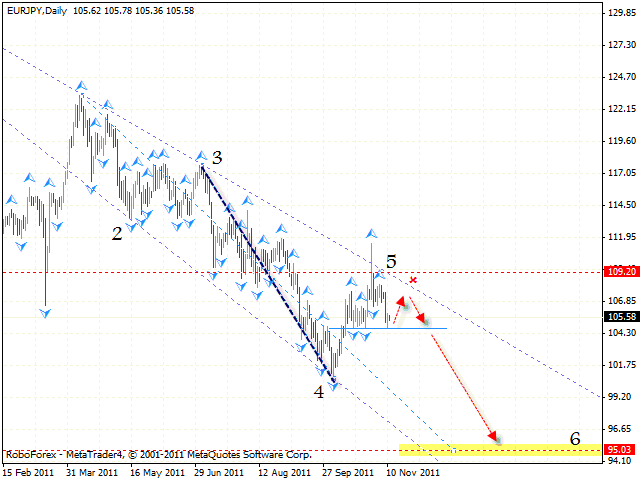 The target of the fall is the area of 1.5784. If the price breaks the pattern upwards, we recommend you to avoid selling the pair. Franc continues moving upwards inside the symmetrical pattern with the final target of the growth in the area of 0.9445. 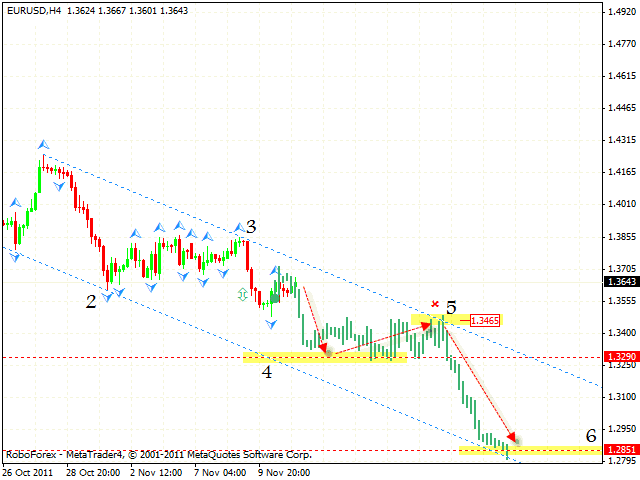 One can consider buying the USD/CHF currency pair with the tight stop. 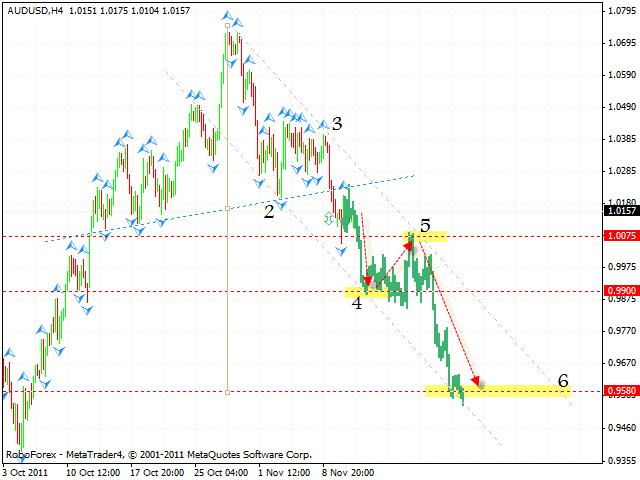 The closest target of the growth is the area of the 4th pivot point, 0.9265. We recommend you to continue buying the pair only after the price reaches the channel’s lower border. The AUD/USD currency pair is still below the neckline, we should expect it to continue falling down. 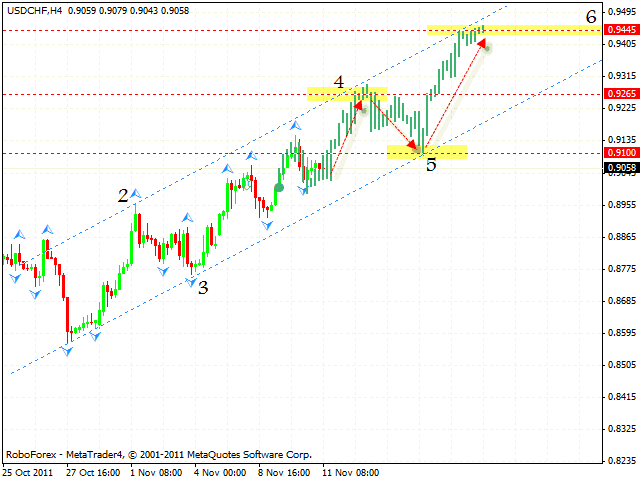 The final target of the fall is the area of 0.9580. At the moment one can consider selling the pair with the tight stop. The closest target of the fall is the area 0.9900. If the price breaks the channel’s upper border and leaves it, this case scenario will be cancelled. The EUR/JPY currency pair keeps moving downwards inside the symmetrical pattern. The final target of the fall is the area of 95.00. At the moment we should expect the pair to grow to the level of 107.00, where one can try to sell it. We recommend you to increase the amount short positions only after the price breaks the support level in the area of 104.70. if the price leaves the channel, this case scenario will be cancelled.